As a tribute to the late Bunny Carr, we republish Alan Corr's January 2012 interview with the presenter. Bunny Carr was one of RTÉ's most popular stars in the early days of Irish television. Now 84, he has lost none of his charm and quicksilver wit. Alan Corr meets him to talk about that famous quiz show, his time as a political PR kingpin, and the love of his life, his late wife Joan. Last year, Bunny Carr was officially registered blind after being diagnosed with macular degeneration. However, when the RTÉ veteran and political PR guru greets me at the door of his home overlooking the bay at Sutton in north Dublin, he has a twinkle in his eye and a broad smile that seems immediately familiar. 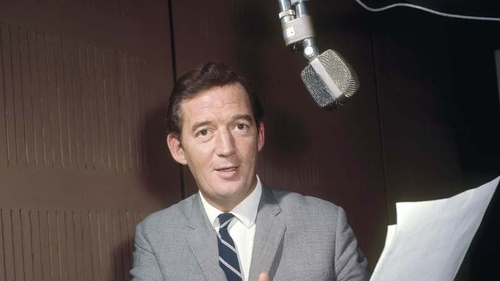 Mention Bunny Carr to anyone under 40 and you might draw a blank but to a certain generation, he will forever be the avuncular host of shows such as Teen Talk, The Politicians, Going Strong and, most famously, the quizmaster on the endearingly naff Quicksilver. At 84, he is a little wider of girth but he still lives in the same house where he settled with his beloved wife Joan back in the '60s. His son Alan and daughter Philomena are nearby (eldest daughter Carolyn lives in France), but Bunny lives alone now. The place looks largely untouched since the '70s, an abundance of Waterford Crystal crowds the sideboard and numerous trophies which Bunny won for his swimming, tennis and sailing prowess line the mantelpiece. Sitting in his large front room as the recent storms rattle the windows from across the bay, he is in cracking form. His conversation is hugely entertaining, everything is told with a laugh in his voice, and he tends to fly off on tangents when names from the past are mentioned. "They handed me a script and told me I started at 5.30. It was 5.26 at the time!" His tales of RTÉ in the early days range from a future distinguished consultant psychiatrist getting so exercised about a point he was making that he fell off the side of the stage on live TV, to witnessing CJ Haughey demand a higher chair during an interview and then turning white when he was asked what it was like being married to the boss's daughter. However, unlike so many of the other young men and women in the fledgling television service, Bunny Carr had no great desire to work in television. "I just didn't want to work in the bank," he says of the job he landed after leaving school in 1947. "I heard there might be a job in RTÉ so I went along and the place was in such a chaotic state that nobody knew what was happening. I was handed a script and told I was on duty at 5.30 and it was 5.26 at the time!" Bunny was always an ideas man. He devised many of the shows he worked on, from the Jacob Award winning Teen Talk to The Politicians, in which the public representatives of the day were invited into studio to face the questions. But he is most famous for Quicksilver and when I ask him what his abiding memory of that fabled era of 'stop the lights' and manic organist Norman Metcalfe, he has no hesitation in answering: "Happiness. I devised the programme. I got the word in the lavatories of RTÉ that they were looking for a quiz that wouldn't cost any money so me as an ex-bank man came up with Quicksilver." It debuted in September 1965, a hi-tech quiz in which "a system of flashing bulbs time-controlled by pulses from the studio clock" counted down on nervous contestants as they answered questions for life-changing sums of money such as 5p. And then there was Norman Metcalfe, the wild organist from Limerick with a degree in divinity from Trinity who played the musical clues. Bunny was a very well-known man in the '60s and '70s but he says he didn't affect him like some of his colleagues. "I was married to Joan you see," he says. Joan was the great love of Bunny Carr's life. She was a local girl who first caught his eye at Sutton tennis club ("You're talking to the Men's Singles Champion here! "), when she, a student physiotherapist, lobbed a ball onto the roof of the pavilion and Bunny noticed her clambering up to fetch it. "She was the worst tennis player in the northern hemisphere but I thought she had great legs!" he says. "So I climbed up after her and said, 'Can I help you?'" It was a real love match that led to a very happy marriage of 51 years but tragedy struck in 1960 when Joan contracted polio when she was two months pregnant with Philomena. "There used to be a wreck of a cottage in my back garden and Alan fell into what had been the sewage of the cottage," Bunny recalls. "Joan rescued him from this mess and cleaned him and that was the most likely source of her polio but Joan never confirmed that because she didn't want to hang it on Alan's neck." She was to spend the next seven months in an iron lung, paralysed from the neck down. "I wondered how a lady who is paralysed from the neck down can give birth to a baby," Bunny says. "I remember the longest night of my life – I was up in Cherry Orchard Hospital where she was and she told me to go home, she said I've got a lot on my mind, I think we're going to have a baby tonight. Joan was in a tin coffin with a lid on it and it was airtight and outside of it was a huge bellows and they blew air into it and that controlled Joan's breathing apparatus. All I could see of my darling wife was her head sticking out on a tray . . ."
He didn't go home that night. He drove to a local garage in his wreck of a Ford Prefect in the rain, flung open the bonnet of the car and proceeded to clean the spark plugs. "I think I must have been off my head," he says. "I think I was loopy but I had to do something. Then I got back into the car at two o'clock in the morning with no heat. I woke up at about 6am and went straight back to the hospital. I went straight to Joan and I remember stopping and preparing myself – I was not sure if I had a wife and I certainly wasn't sure if I had a boy or a girl. I was afraid to walk into the room but I did and there she was in her iron lung and the lid was up and there was our little baby girl, Philo." The smile spreads across his expressive face at the memory. Bunny left RTÉ in 1984 to concentrate on Carr Communications, the PR and media training company he had founded ten years previously. "Joan was really not very well, she was in a wheelchair," he says. "I sat down and thought to myself how many guys over 50 are there in RTÉ still doing well? There was Gaybo, who's a great old pal of mine, but that was it. I thought I’d better do something because when I die, I don't want Joan to be evicted. So I started Carr Communications." Six former Taoisigh passed through the corridors of Carr but it was Bunny who also trained Padraig Flynn, the man who spectacularly sabotaged his own career, with a little help from Gay Byrne on the Late Late Show. He had better luck with Garret Fitzgerald, the first Taoiseach to have media training, and Bunny tells a great story about the night Fitzgerald was in Carr Communications at the same time that Haughey was present for his own spin and polish. Bunny had become poacher turned gamekeeper, no longer the avuncular TV host but somewhat of a kingmaker as media became all important in the world of politics. "My attitude was this," he says, suddenly turning very serious. "We live in a democracy and the people we elect should be able to tell the electorate how things are going and they weren't. They were in the business of self-defence." He retired from Carr Communications in 2004 and Joan passed away a year later. Bunny has eleven grandchildren and two great-grandchildren and he can look back on a remarkable life, but everything returns to Joan. Bunny's eyes may see very little these days but they sparkle at the mention of her name. Outside, the storm is really battering at the windows but many years ago when the sea was placid and the air was warm, Bunny would go swimming just feet from their front door as Joan looked on proudly. "There used to be a telegraph pole out there that went into the sea and when I came home from the bank I always felt that I needed a wash," he says. "So I'd change into my togs, jump over the wall and slide down the pole into about five feet of water. Joan would wheel out in her chair and look over the wall and she'd wave at me with her good hand..."
He pauses and says: "You know, her loyalty never flickered in 51 years. I don't expect you to believe this, but we never had a row. Joan only did one mean thing in her life – she went to heaven without me."